← 1000 Days & Counting! *Use Virgin Coconut oil, if you want the coconut flavor or the expeller pressed for a plain chocolate flavor. I have done it both ways and personally prefer the plain chocolate flavor. Mix all ingredients but the pecans with a mixer or blender. Mix until smooth. Stir in the pecans. Bake in a parchment lined 7 inch by 12 inch pan. I did mine in a glass pan. Bake it at 350 for 20-25 minutes. Do not overbake. It will still be soft when you take it out. Let it cool completely before cutting. I ate a bite hot, but have to admit it was a better texture after it cooled a couple of hours. This turned out amazingly well and my husband declared the recipe a keeper. He said, “No one could tell this wasn’t the typical brownie recipe.” We love pecans, but this would be good with walnuts, too. Is this chewy like a brownie? Looking at ingredients I would think it would be more like a candy bar. Hope to try it soon. My husband says it is just like brownies. 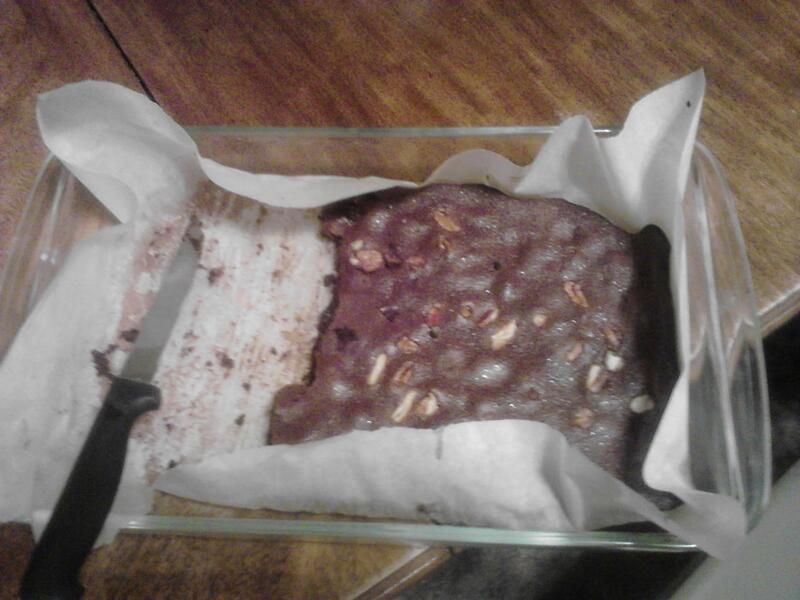 It is a candy like when hot, but then, gets the brownie texture after it cools.